Coconut cookies. You are either a lover or a hater. I’m a lover. 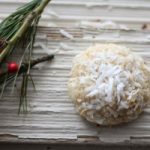 This recipe for Simple Coconut Cookies is one simple and delicious little nugget of coconutty deliciousness. It is moist and chewy. Full of coconut flavor. You probably have all of the ingredients in your pantry to make these little gems. It will take you 5 minutes to mix up the dough. Bake for 30 minutes while you clean up the mess and powder your nose. You don’t powder your nose? Neither do I. Anyway. You’re going to love these. Less than a week before Christmas. Set aside 2 loosely packed cups of coconut on a plate. Place remaining coconut in a food processor along with sugar, salt, and baking powder; process until finely ground. Add butter, and process just until no lumps remain. Add egg and vanilla; process just until smooth. Add flour; pulse until a crumbly dough begins to form, scraping sides of bowl as needed (do not over mix). If the dough is a bit dry, add a splash of milk until the dough comes together. Do not over mix. Arrange balls, about 2 inches apart, on baking sheets. Do not flatten the balls of dough. Bake until lightly golden, 23 to 25 minutes. Cool on baking sheets 1 to 2 minutes; transfer to a wire rack to cool completely. If desired, sprinkle with a bit more coconut while hot. This recipe yields about 15-18 cookies if using a 2 1/2 inch cookie scoop. The cookies are very rich, and can be made using a smaller scoop or spoon. These sound fabulous – I am definitely going to make them! Just a question about the coconut – is one package actually 5 1/3 cups? Is that the amount you need for the recipe?